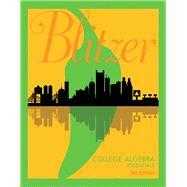 With the new edition, Blitzer takes student engagement with the mathematical world to a whole new level drawing from applications across all fields as well as topics that are of interest to any college student (e.g., student loan debt, grade inflation, sleep hours of college students). Applications are also brought to life online in a new, assignable video series that explore the entertaining and mathematical Blitzer Bonus boxes. The new edition also aims to help more students to succeed in the course with just-in-time support in the text — such as Brief Review of prerequisite topics, Achieving Success boxes, and Retain the Concepts exercises — as well as support within MyLab™ Math such as new concept-level videos, assignable tools to enhance visualization, and more.